Felizmente para ambos, Portugal é um lugar distante ou teriam às costas Centeno, Costa, Martins, Mortágua, Sousa & associados, ávidos por sem esforço algum, em nome do Estado esbulharem mais de 50% do resultado da criatividade e esforço alheio, sob a forma de impostos, prática que tenho dificuldade em classificar, será parasitismo ou proxenetismo? quanto apostam que os criminosos laranjas se safam todos? Just about the most massively useful thing any interstellar Hitchhiker can carry. Partly it has great practical value. You can wrap it around you for warmth as you bound across the cold moons of Jaglan Beta; you can lie on it on the brilliant marble-sanded beaches of Santraginus V, inhaling the heady sea vapours; you can sleep under it beneath the stars which shine so redly on the desert world of Kakrafoon; use it to sail a miniraft down the slow heavy River Moth; wet it for use in hand-to-hand combat; wrap it round your head to ward off noxious fumes or avoid the gaze of the Ravenous Bugblatter Beast of Traal (a mind-bogglingly stupid animal, it assumes that if you can’t see it, it can’t see you — daft as a brush, but very very ravenous); you can wave your towel in emergencies as a distress signal, and of course you can dry yourself off with it if it still seems to be clean enough. “Apesar de ter sido eleito pela Direita, só tem feito o jogo da Esquerda“. 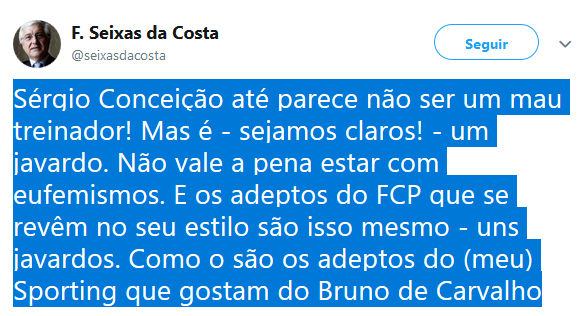 Falta-lhe juntar-se aos que anseiam pela desgraça.